Later that day, a gala dinner be held in honor the finalists (some of which we hope are from Las Vegas) at the hotel. Tickets are still available and it would be nice for Las Vegans to show the Oscars of the food world what kind of culinary community we are. 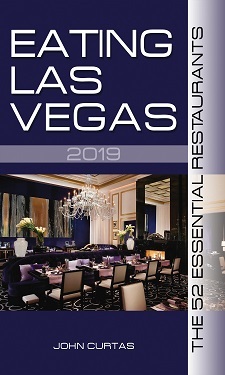 This year, Vegas has three nominated semi-finalists: Joël Robuchon for Outstanding Service, Picasso for Outstanding Wine Service, and Mitsuo Endo of Raku for Outstanding Chef Southwest. The last time the JBF was in town was in the fall of ‘o8, just as the full force of the economic crash was hitting us. Yours truly was the emcee for that event, and let’s just say, the mood in the crowd was less than festive (for good reason). Here’s hoping this event will be a great success and provide a nice bookend to frame the financial turmoil this city (and this country) has been through. It promises to be a great event. If Las Vegas residents would get out and support the JBF at events like these – the city might even stand a chance at hosting THE award show at some point in the future. Let’s show them that Vegas is indeed the great food town we all think it is. Happy St. Paddy’s day Johnny! I wish I could be there for the JBF anouncements. Keep your fingers crossed for Restaurant 1833 in the “best new restaurant” category!